This kit is designed to provide maximum Molle Bar coverage at all roll bar locations on a 1997-2002 TJ Wrangler with hard top. Please see Kit 2 for fewer molle bar sleeves. This kit is designed to provide the maximum Molle Bar coverage on a 1997-2002 TJ Wrangler with soft top. See kit 2 for a different assortment of Molle bar sleeves. This kit is designed for Molle Bar coverage on a 1997-2002 TJ Wrangler with hard top. This provides Molle Bar Sleeves in all locations. For more coverage please see the 1997-2002 TJ Kit 1. This kit is designed for Molle Bar coverage on a 1997-2002 TJ Wrangler with soft top. This provides Molle Bar Sleeves in all locations. For more coverage please see the 1997-2002 TJ Kit 1 – soft top. This kit is designed to provide maximum Molle Bar coverage on a 2003-2006 TJ or LJ Wrangler with hard top. This kit has 11 Molle bar sleeves compared to the 2003-2006 TJ with hard top Kit 2 that has 7 Molle bar sleeves. Please see “In The Box” for items included on this package. This kit is designed to provide maximum Molle Bar coverage on a 2003-2006 TJ and LJ Wrangler with soft top. 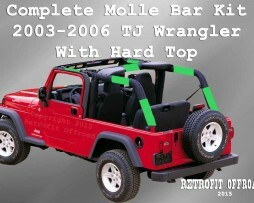 This kit includes 9 Molle Bar Sleeves for maximum Roll Bar coverage. This kit is designed for Molle Bar coverage on a 2003 – 2006 TJ or LJ Wrangler with hard top. This provides Molle Bar Sleeves in all locations. For more coverage please see the 2003 – 2006 TJ Kit 1 – Hard Top. This kit is designed for Molle Bar coverage on a 2003 – 2006 TJ or LJ Wrangler with soft top. This provides Molle Bar Sleeves in all locations. For more coverage please see the 2003 – 2006 TJ Kit 1 – soft top. 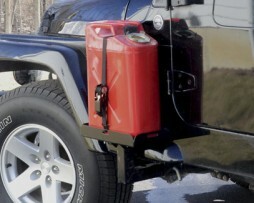 Storage is always at a premium in a Jeep Wrangler, especially one that’s used offroad, for camping, or overlanding. The 32″ inch Tactical Spare Tire Cover provides additional storage for the Jeep – it has several places to attach military-style MOLLE pouches, and it also has an interior storage compartment. MOLLE (pronounced molly, as in the female name) is an acronym for Modular Lightweight Load- carrying Equipment. It is used to define the current generation of load-bearing equipment and backpacks utilized by a number of NATO armed forces, especially the British Army and the United States Army. The system’s modularity is derived from the use of PALS webbing as rows of heavy-duty nylon stitched onto the vest to allow for the attachment of various MOLLE-compatible pouches and accessories. This method of attachment has become a de facto standard for modular tactical gear. The 32″ Inch Tactical Spare Tire Cover is made using Mil Spec 1000D Cordura fabric. 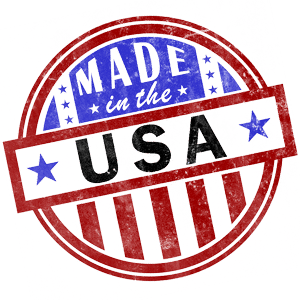 It is designed with 3 separate areas of MOLLE grid – Two smaller MOLLE grids (One on each side of the Tactical Spare Tire Cover) and one larger MOLLE grid centered on the front of the cover. The 32″ Tactical Spare Cover has a large zippered storage space inside the Tactical Spare Tire Cover. You can easily store a tow strap and other gear in the zippered storage pouch area. The MOLLE grid is convenient to carry all of your modular tactical gear and modular pouches. Our Tactical Spare Tire Covers have 3 velcro areas (above each MOLLE grid) so you can personalize your Tactical Spare Tire Cover with velcro morale patches. Storage is always at a premium in a Jeep Wrangler, especially one that’s used offroad, for camping, or overlanding. The 35″ inch Tactical Spare Tire Cover provides additional storage for the Jeep – it has several places to attach military-style MOLLE pouches, and it also has an interior storage compartment. The 35 Inch Tactical Spare Tire Cover is made using Mil Spec 1000D Cordura fabric. It is designed with 3 separate areas of MOLLE grid – Two smaller MOLLE grids (One on each side of the Tactical Spare Tire Cover) and one larger MOLLE grid centered on the front of the cover. The 35″ Tactical Spare Cover has a large zippered storage space inside the Tactical Spare Tire Cover. You can easily store a tow strap and other gear in the zippered storage pouch area. The MOLLE grid is convenient to carry all of your modular tactical gear and modular pouches. Our Tactical Spare Tire Covers have 3 velcro areas (above each MOLLE grid) so you can personalize your Tactical Spare Tire Cover with velcro morale patches. Storage is always at a premium in a Jeep Wrangler, especially one that’s used offroad, for camping, or overlanding. 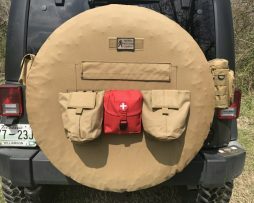 The 37″ inch Tactical Spare Tire Cover provides additional storage for the Jeep – it has several places to attach military-style MOLLE pouches, and it also has an interior storage compartment. The 37 Inch Tactical Spare Tire Cover is made using Mil Spec 1000D Cordura fabric. It is designed with 3 separate areas of MOLLE grid – Two smaller MOLLE grids (One on each side of the Tactical Spare Tire Cover) and one larger MOLLE grid centered on the front of the cover. The 37″ Tactical Spare Cover has a large zippered storage space inside the Tactical Spare Tire Cover. You can easily store a tow strap and other gear in the zippered storage pouch area. The MOLLE grid is convenient to carry all of your modular tactical gear and modular pouches. Our Tactical Spare Tire Covers have 3 velcro areas (above each MOLLE grid) so you can personalize your Tactical Spare Tire Cover with velcro morale patches.